Why not get the best of Indian classical, folk, jazz, blues and funk all in the same experience! The event, organised by Teamwork Arts as a part of the revival of Friends of Music, is the Season 2 finale of the monthly concert series showcasing rich Indian Classical and Folk music, in a Baithak-style ambiance. Why not get the best of Indian classical, folk, jazz, blues and funk all in the same experience! The November edition of Under a Banyan Tree on a Full Moon Night toasts the multi-genre creativity in fusion music. Fusion denotes the melding together of two specific musical cultures; that of the east and the west. Since the ‘50s, Indian and Western musicians have been collaborating and jamming, mixing and matching and trying to mimic ragas on violins, and pentatonic minors on sarods. This intermingling of two diverse and rich musical schools has created unique sonic adventures and some of the greatest and most experimental music of our times. 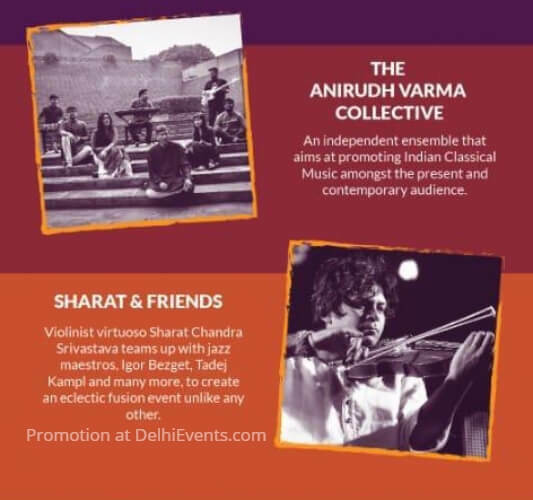 This month, the Anirudh Varma Collective, an ensemble of expert musicians with a penchant for fusion experimentation, and Sharat and Friends, an exploration of the sounds of India and the West, are set to take the stage under the banyan tree! The Anirudh Varma Collective is an independent ensemble which aims at promoting Indian Classical Music amongst contemporary audiences. The Collective was born out of Anirudh's desire to bring together a community of diverse musicians and give them a space to explore soundscapes. The idea of collaboration has always excited Anirudh, and ever since he began studying Indian Classical music, he has always wanted to turn this desire into a reality. This was the intention and driving force behind working on the debut album ‘Perspectives’, which features over 60 musicians from across the country. Sharat Chandra Srivastava started learning how to play the violin at 7, from his grandfather, the renowned North Indian violinist Pt Joi Srivastava. He is part of India's premier rock band Parikrama and founded the Delhi-based fusion band, Mrigya. Sharat has explored a range of genres and musical traditions, and founded Sharat and Friends with the hope of continuing that exploration.For this performance, Sharat will be joined by Igor Bezget, Tadej Kampl, Chintan Kalra, Joshua Grant, Sid Mathur, Karan Sharma, Ishaan Chhabra and Madhabika Nayak; a stellar line-up of expert musicians who are sure to set the stage alight.